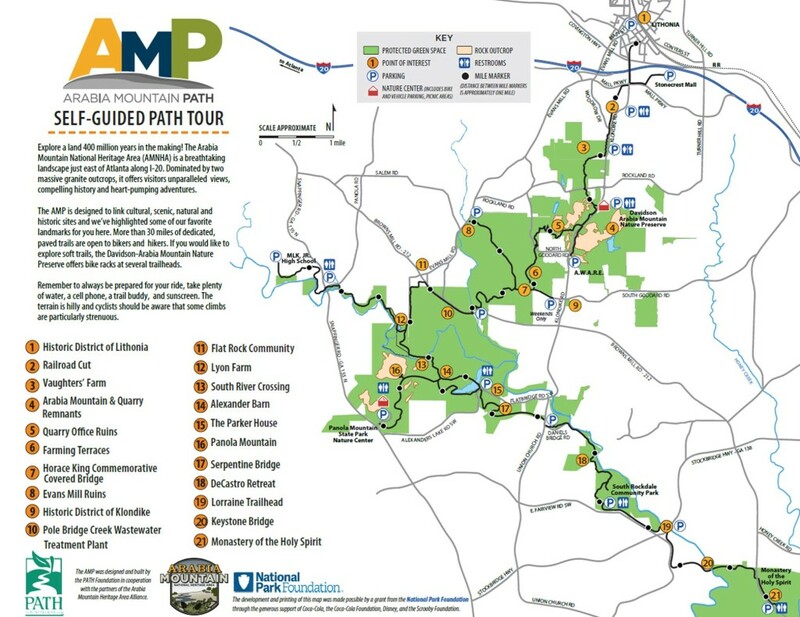 The Arabia Mountain PATH (AMP) is a 30+ mile recreational trail located just 20 minutes east of Atlanta. Walkers, cyclists and joggers share the multi-use trail. From the first mile the AMP was designed to hug the landscape and take you past historic landmarks and stunning vistas. Each curve tugs at your feet and beckons you to find out what surprises lie beyond the next bend. Ready to go? Download the interactive map below and come explore! You can access the AMP from 15 free parking lots located along the trail. Two additional parking lots are located within Panola Mountain State Park. There is a $5 Georgia State Park parking fee if you use these parking lots unless you have a Georgia State Park Parking Pass. Is the AMP a strenuous trail? Your own fitness level will determine if you find the trail moderate, intermediate, or difficult. All trail users should expect to encounter hills along the AMP. The trail meanders through woods, meadows, and state and county parks. The varied terrain can be challenging so bring plenty of water, good hiking shoes, and sunscreen. It is also a good idea to bring your cell phone and a hiking buddy. No motorized vehicles are allowed on any PATH trails except for motorized wheelchairs. However, any non-motorized vehicle with wheels is allowed. Examples include bikes, strollers, rollerblades, unicycles, and scooters.